A couple days ago, Stella and I made a gingerbread house. Actually, I put it together following step-by-step instructions, while she ate the chimney, tree, and most of the roof’s structurally necessary frosting. Later, the same frosting would come out of my nose, because I can’t resist it either, and Stella made me laugh while I bent over to pick her up. The gingerbread house experience leads me to wonder how babies “know” about candy upon seeing it for the very first time. I opened the gingerbread house kit from Williams-Sonoma, and Stella immediately began gnawing on the package of gumdrops and clawing at sealed cookie components, whining and panting because she could not wait to eat them. Mind you, she’d just eaten a man-sized dinner. I thought she was absolutely full. Besides, this kid had never before seen anything resembling a gumdrop. I asked Cody how she knew instantly what the sweet gems were all about, and he gave a pretty good explanation: “It’s instinctual! Gum drop detection is part of our evolution.” Of course it is. They’re like berries, but with high fructose corn syrup. Totally necessary for survival–of the holidays. It’s not just the season’s sweets that get Stella excited. She loves the Christmas tree. She dotes on it with gentle, arms-wide-open hugs. She does laps around it, and inspects all the eye-level ornaments every hour or so, touching them while saying a nasal-y “no.” Because without realizing it, that’s what I taught her to do. For the first several days, the tree was star-less. 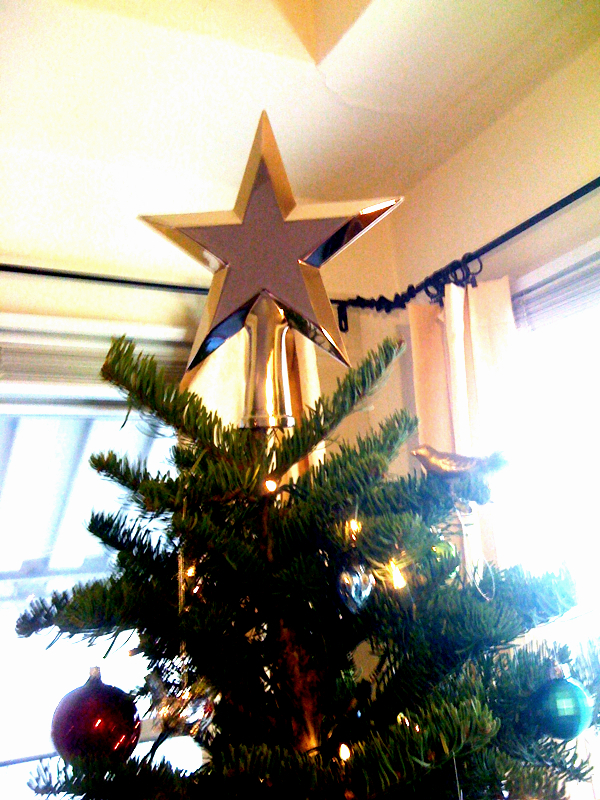 So I ordered a wonderfully simple star tree topper from Red Envelope, and it arrived during Stella’s nap early this week. I put it up atop the tree right away, admired it proudly for a moment, then promptly forgot about it. Not long after, Stella awoke from her nap. The first thing she did? Gazed up at her new best friend the Christmas tree, smiled, and with her sparkly blue eyes growing ever wider, pointed at the star in dramatic, overly excited fashion. She did the same when I hung my “PEACE” banner on the mantle. She not only smiled and pointed, but actually applauded. The banner isn’t exactly what I’d hoped it would be, but I did put some real work (not to mention money) into it, and the fact that Stella appreciated it so much almost brought tears to my eyes. She’s just so incredibly sweet. As you can see, Stella understands holiday magic. So do I, and so does my mom. This appreciation, and a general affinity for wonder, has been handed down along with the most unruly cowlicks imaginable. On Tuesday, my mother’s latest act of kindness arrived. It was carefully tucked in tissue paper in the bottom of a large box, in which we also found a package of adorable, unbreakable (genius) ornaments and a classic, wooden, German ornament of a little chef holding a large wooden spoon, which Stella immediately grabbed and pretended to eat with. This delivery is probably the millionth treasure–holiday or otherwise–that my mom has created for me during my 32 years. For example, on game day throughout high school, I’d consistently find a bit of crafty motivation in my lunch or backpack, like a construction-paper basketball with multi-colored flames shooting off the sides and a markered message along the lines of “Light ’em up!” or “You’re on fire!” Sometimes I really did light ’em up, and I think she’s largely responsible for that. She saved every newspaper article, even the smallest mention of me, and attended just about all of my games. Christmas? Well, that was always magical, even when my parents were young and completely broke. I know, I’m lucky. So, you’re probably wondering, “What on earth did she give you? A giant diamond she’d made by crushing carbon with her bare hands?” No, it was better. I opened the box to discover that she’d made me the most gorgeous tree skirt ever in the history of Christmas. If Jesus Christ himself had a Christmas tree and accompanying skirt, I’m sure it was nowhere near as holy and beautiful as this. Honestly, I’d searched Etsy for tree skirts last week and found nothing that even compared to my mom’s work of art. In fact, this tree skirt is probably the most wonderful thing I own. It embodies my ideal style, with a design that’s charmingly simple but not at all stark, and plenty of cheerful but balanced color and splashes of bold, joyful pattern. The luxurious fabric and perfect trim are so incredibly stylish yet timeless, and even incorporate the specific colors or our decor. 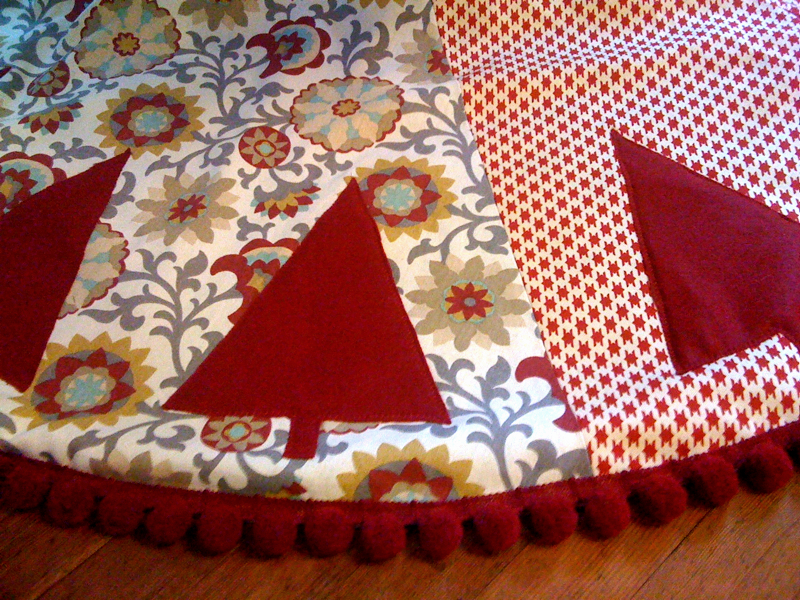 As anyone who has given or received a truly thoughtful, handmade gift knows, it’s more than a tree skirt. It’s even more than an heirloom. It’s a symbol of something much greater. Love, of course! And Martha-Stewart-esque skills that I’ll probably never have. 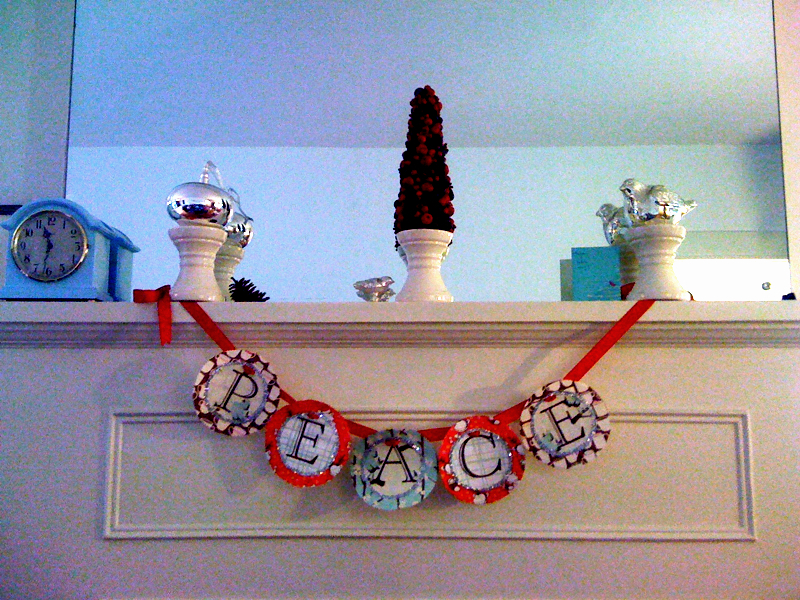 My holiday banner is too busy and warped by over-gluing. Martha would not eat leftover gingerbread house frosting “glue” straight from the bag, and she probably wouldn’t allow her edible creation to be smudged on all sides with sugary toddler handprints. But who cares? What I lack in skill I make up for with holiday cheer. More importantly, I’ve got an amazing daughter and mother with whom to share it. This entry was posted in Family update, Inspiration, toddler and tagged christmas tree skirt, gingerbread house, holiday banner, holiday crafts, motherhood, star tree topper, toddler. Bookmark the permalink. I think your banner looks great! I like it much better than mine!! Thanks, Jessica! I hope you’ll post a picture of yours–I’m sure it’s a beauty!